No4: The sole solution to realize is thermoelectric coolers. The thermoelectric refrigerator can not even equal the performance of the compressor type as described in the story No.3. This is, however, correct only within a range of size for which the compressor type can be manufactured and functional. One of the main features of the thermoelectric system is to be able to reduce the size without changing the performance. 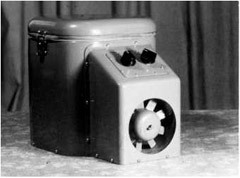 By making use of this feature, various kind of compact size thermoelectric refrigerators were developed for personal use, while there lied down a problem specific to the thermoelectric systems that they were technically feasible but unclear whether accepted in the market. At first, a compact size refrigerator for passenger cars was developed in the 1960’s (Photo.1). In those days, people could just afford to have cars and left no room for articles for luxury like the automotive refrigerator. It was too early for the product to appear in the market, but it achieved a re-debut in 1990’s after 30 years. Based on the system shown in Photo.1, a portable refrigerator for a recreational use was developed in 1976 and released to the market as an OEM article from D company and recorded sales of around 500 systems. However they disappeared from the market because people’s image for the thermoelectric chiller was to be able to simultaneously cool down and the product failed to live up to their expectation. Then, about three years later, we received an offer to develop a cooler box for fishing bait by downsizing the portable refrigerator. Photo. 2 show the developed bait cooler. The size was 120mm×210mm×190mm. We bought a lot of lugworms and tried to examine their behavior at various temperature conditions. At 20°C, the lugworms were very vigorous and cannibalized each other, resulting in low survival rate. When the temperature was lowered to 10°C, the lugworms went into state of suspended animation and their survival rate increased. It was imagined that this bait cooler was a very attractive article for anglers,but the cooler could not appear in the market because the price was too expensive compared to that of lugworms. 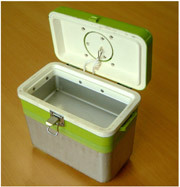 Then we developed a portable insulin cooler which was similar in concept to the bait cooler in 1984 after 6 years. It was difficult in those days for diabetic patients to travel far from homes or hospitals which prepared a refrigerator for insulin because the insulin was vulnerable to temperature. The mobile insulin cooler seemed to solve this problem. While we prepared to introduce it to the market, however, there appeared a strong prospect in developing new insulin viable in higher temperature. And the cooler lost a chance to show off. Komatsu decided around 1985 to move out from the consumer market and focus our business on industry use area. So, we were surprised a few years ago when we found the miniature cooler revived again as a cooler for cosmetics (Photo.3). It is called ‘cosmecooler’. This was a really good application for the thermoelectric cooler. A boom of the naturalism spread into the cosmetics and they became to be made only from natural ingredients and free from antiseptics or artificial colorants. These natural cosmetics , however, have weak points to be easy to rot and get moldy. It is thought to keep these natural cosmetics in a domestic refrigerator, but there is fear that the cosmetics absorb the odor of the refrigerator or the fume of the cosmetics spreads to the food. Therefore this miniature cooler became a must-buy for naturalistic women. In addition, it was found that cooled cosmetics had a good effect on the skin as well as the quality. They studied the effect by changing the temperature of cosmetics and the result showed that 7°C is the most suitable temperature for the liquid type and 12°C for the cream type. This temperature range is the most appropriate for the thermoelectric module to demonstrate good performance. 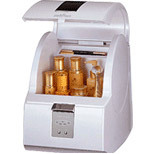 The boom started in Hong Kong and Korea, and the cosmecooler was introduced to Japan. In Korea, a famous actress ignited the boom by using the cosmecooler. It is expected that the boom will be instigated also in Japan with ingenious marketing.